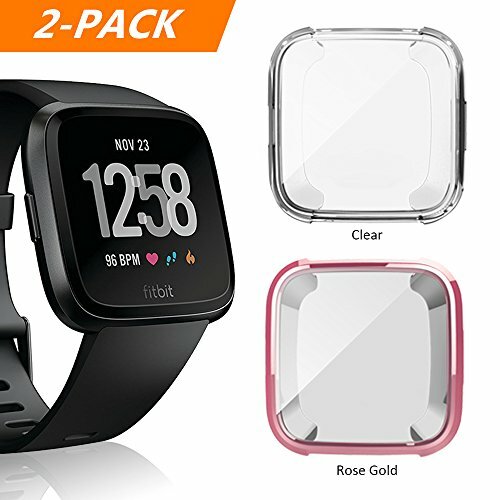 Fitbit Versa Case, 2 PACK Belyoung Soft TPU Slim Fit Full Cover Screen Protector for Fitbit Versa Smartwatch by Belyoung at All Company Mobiles. MPN: Bel006-rc. Hurry! Limited time offer. Offer valid only while supplies last. Special Advantage: Comparing to the traditional case, we updated the design: You do not need to take off your watch band when it is charging, just take off this case, very easy and convenient, and the case will not fall off during your daily use. We did the practice about this. Material: high quality TPU, soft and slim. protect your fitbit versa from scratches, drop, bump and so on. 99% high transparency, still responsive to touch with this case covering your watch. Application: Design for fitbit versa. very easy to put on and take off. Your do not need take off your watch band then it is charging. Warranty: For 18 months after the date of purchase, we take care of all quality-related issues with a REPLACEMENT or REFUND. Any peoblem, please feel free to contact us "Belyoung". Package Include: 2 * Full Protection Case with Screen Protector. If you have any questions about this product by Belyoung, contact us by completing and submitting the form below. If you are looking for a specif part number, please include it with your message.